Intense media interest and a number of high-profile court cases have kept the assisted suicide debate in the public eye. Nurses and care support workers are often the members of staff that patients feel comfortable enough to talk to about a desire to actively hasten death. 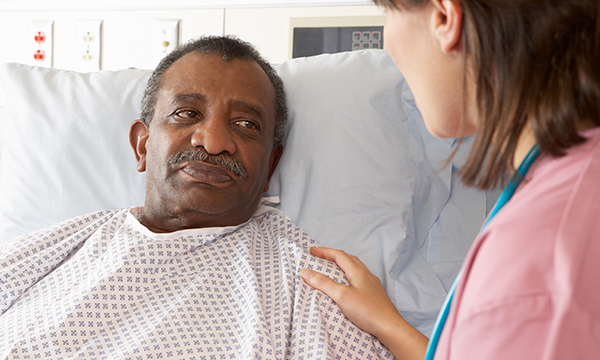 As assisted suicide is a controversial and divisive issue, it can be difficult for nurses to determine how best to respond professionally and compassionately to such a request, as well as continuing to support patients in their ongoing care. New guidance to help nurses respond to requests from patients regarding assisted suicide has been published by the RCN. Updating the previous guidance from five years ago, the document reinforces that assisting a suicide is illegal but also provides practical advice on dealing with difficult conversations and delivering good quality end of life care. It has been revised to reflect changes to organisations, sources of support for nurses and changes to palliative care such as the end of the Liverpool Care Pathway. It clearly sets out the laws in all four UK countries. According to the guidance, assisted suicide is when someone is given the means and assistance (for example using drugs or equipment) to take their own life. The RCN has a neutral position on the issue. It says there is a clear distinction between therapeutic decisions taken as part of palliative and end of life care, and actively taking actions to end life which is a feature of assisted suicide or euthanasia (defined in the guidance as ‘the taking of direct action by a doctor to end a patient’s life’), both of which are unlawful. Nurses should feel confident that asking a patient who discusses a wish to die about these comments is not assisting or encouraging that patient to take their own life. Such conversations might be the only time a patient opens up and discusses their worries and it is an essential part of nursing practice to recognise and explore concerns. Recent calls for changes in law to allow physician-assisted suicide have all so far been rejected by UK parliaments. Conducting difficult conversations is central to the provision of high quality palliative and end of life care. Take time to explore the background to the request as understanding the thoughts behind these requests is central to formulating a professional response and an appropriate plan of action. You should not abandon, judge or chastise a patient for voicing their feelings. Ask questions that draw out emotional or practical concerns, and encourage the patient to have a voice in their future care. Be gentle but direct in reflecting back what you have heard and clarify what is being asked. ‘It is vital that nurses know both their legal position and feel able to have difficult conversations about end of life care. It can be very challenging for nurses, but if they do not have these conversations with patients then they cannot find out what it is that is really concerning them. ‘This is even more important if someone is asking for help to end their life. Patients are often bewildered and afraid and one of the most difficult things for nurses is that they cannot guarantee that someone’s death will be completely comfortable and without pain. ‘But a nurse can reassure patients and the people important to them that they will do everything they can to ensure the best quality of life and the best death possible.